The Tyler Prize Executive Committee announces the awarding of the 2009 Tyler Prize for Environmental Achievement on its thirty-sixth anniversary to Dr. Richard B. Alley and Dr. Veerabhadran Ramanathan. The 2009 Tyler Prize for Environmental Achievement is being awarded to Professor Richard B. Alley in recognition of his contributions to our understanding of global climate change and human impacts on climate and environment. He is being honored for his study of glaciers, his interpretation of the Earth’s climate history that is frozen into ice cores from Greenland and Antarctica, his presentation of evidence that the Earth’s climate has changed abruptly in the past and is likely to do so again, and his description of the forces that drive these global changes. He is widely recognized for his impact on the field of glaciology — for establishing its place with the field of climate sciences, for enhancing the stature of cryosciences, for serving as a “public citizen” who communicates with the lay public and with decision-makers, and for showing other scientists how this public involvement can be accomplished successfully. Professor Alley was a member of the Intergovernmental Panel on Climate Change (IPCC) when it received the Nobel Peace Prize after the publication of its Fourth Assessment Report in 2007. Professor Alley is considered one of the world’s leading climate researchers and glaciologists. He is a specialist in the physical properties of ice and the characteristics of water, ice, bedrock, and sediment at the base of glaciers and ice sheets. He has been on eight research expeditions to Greenland and three to Antarctica, and he has worked on the drilling of ice cores and interpretation of the gases trapped within them. In the late 1980s and early 1990s, Professor Alley joined an enterprise organized by the U.S. National Science Foundation to drill through the Greenland Ice Sheet to bedrock. The Greenland Ice Sheet Project II ran from 1989 to 1993 and produced an ice core of 3,053 meters (just over 10,000 feet) in length. It also produced a record of Earth’s climate reaching back over 110,000 years, and Alley has written extensively about the stories it has to tell. Atmospheric chemicals, dust and other indicators enabled him and his colleagues to construct a record of environmental phenomena such as wind patterns, temperature and precipitation that indicated that Earth’s climate has changed suddenly. The analysis of the ice core suggests that the last ice age came to an abrupt end over a period of only about three years, and Professor Alley’s research indicates that global climate changes now underway could produce similarly dramatic changes over short times. Professor Alley’s study of the cryosphere is not limited to the study of past events: he and colleagues have shown how tides affect the ice streams of West Antarctica, including observational evidence that this influence reaches far inland, demonstrating the potential vulnerability of the Antarctic ice sheets to collapse in a warming world. He also has used modeling tools to examine recent movements of the Greenland ice sheet and to predict their contribution on sea level rise in the future. Professor Alley was born on August 18, 1957 in Columbus, Ohio. He earned his B.S. in 1980 and his M.S. in 1983, both in geology, from The Ohio State University in Columbus. In 1987, he earned his Ph.D. in geology from the University of Wisconsin-Madison, and he then worked as an assistant scientist with the UW-Madison Geophysical and Polar Research Center for one year. In 1988, he began his career with the Department of Geosciences at The Pennsylvania State University in University Park, where he teaches and conducts research on paleoclimatic records as a means of understanding the climate system and its history and of projecting future changes in climate and sea level. In 2000, Penn State named him an Evan Pugh Professor, the highest distinction that the university can bestow upon a faculty member. Professor Alley also is an associate of the university’s Earth and Environmental Systems Institute. Professor Alley is a member of the National Academy of Sciences (2008) a fellow of the American Geophysical Union (2000), and the recipient of numerous honors and awards. He received a Presidential Young Investigator Award from the National Science Foundation in 1990 and a Packard Fellowship from the David and Lucile Packard Foundation in 1991. His contributions as a teacher and as a scholar have distinguished his work at Penn State: he received the Wilson Outstanding Teaching Award in 1997 from the College of Earth and Mineral Sciences; the Faculty Scholar Medal, chosen by the university president and a panel of Penn State faculty, in 1999, and the Milton S. Eisenhower Award for Distinguished Teaching in 2008. He also has received the College of Earth and Mineral Sciences Mitchell Award for Innovative Teaching (2004) and Faculty Mentoring Award (2007). Professor Alley’s work has attracted honors from colleagues and professional organizations around the world. He received the Horton Award (now known as the Hydrologic Sciences Award) from the Hydrology Section of the American Geophysical Union (1996) and the Seligman Crystal from the International Glaciological Society (2005). The European Geosciences Union awarded Professor Alley its first Louis Agassiz Medal (2005) to honor his “outstanding scientific contribution to the study of the cryosphere,” and the American Geophysical Union honored him with its Roger Revelle Medal (2007). 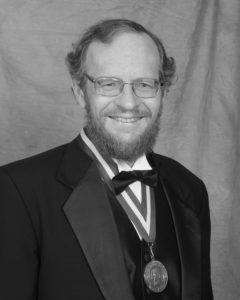 The Geological Society of America has honored him with its Easterbrook Distinguished Scientist Award (2002) and with its Public Service Award (2008). Professor Alley’s service on advisory boards, review boards, steering committees, and other panels, past and present, involves roughly 55 organizations. Of particular note is his service with the Intergovernmental Panel on Climate Change. He was a contributing author and reviewer for the IPCC in 1994-95 and in 2000, and a lead author and contributing author in 2004-2006. His involvement in producing the Fourth Assessment Report of the Intergovernmental Panel on Climate Change, published in 2007, was honored when the IPCC as a whole received the Nobel Peace Prize, sharing it with former U.S. Vice President Al Gore. Also of note is Professor Alley’s service to the National Academy of Sciences and its National Research Council (NRC). He chaired an NRC panel on abrupt climate change from 2000 to 2002 which produced a book in 2002 titled “Abrupt Climate Change: Inevitable Surprises.” He also served on a panel on abrupt climate change organized by the U.S. National Oceanic and Atmospheric Administration. Professor Alley has provided advice upon request to numerous federal officials in multiple administrations, including a U.S. vice president, the president’s science adviser, and committees and individual members of the Senate and the House of Representatives. Professor Alley has contributed to 21 books as an author, and he has published more than 180 papers in peer-reviewed journals. He has also written or contributed to 60 additional publications, including books and periodicals. His publications have been cited more than 8,000 times, and he is rated as a “highly cited” researcher by the ISI Web of Science. According to the ISI Web of Knowledge, he is listed as an author on 30 articles in the Journal of Glaciology published by the International Glaciological Society; 14 papers in Geophysical Research Letters and four papers in the Journal of Geophysical Research-Atmospheres, both published by the American Geophysical Union; 15 articles published in Science and 10 papers published in Nature. Professor Alley also has produced or helped produce three books. He is the author of “The Two-Mile Time Machine: Ice Cores, Abrupt Climate Change, and Our Future,” first published in 2000 and now available in paperback and in translations into Spanish and Japanese. He was an editor for the book “The West Antarctic Ice Sheet: Behavior and Environment” published in 2001 by the American Geophysical Union in its Antarctic Research Series. The 2009 Tyler Prize for Environmental Achievement is being awarded to Professor Veerabhadran Ramanathan in recognition of his contributions to understanding global climate change and human impacts on climate and environment. He is being honored for his work in establishing the greenhouse effect of trace gases in the atmosphere and describing the effects of water vapor, clouds, and aerosols as factors in global climate change. He is widely recognized for establishing the greenhouse impacts of gases other than carbon dioxide (CO2), for demonstrating that soot can play an unexpectedly large role in the Earth’s thermal budget, and for leading the research that discovered “brown clouds” that hang over South Asia for several months every year. Professor Ramanathan is considered one of the world’s leading atmospheric scientists, and his work has focused on the impact of human activities on climate and global climate change. Until the mid-1970s, scientists believed that the burning of fossil fuels and widespread deforestation were the primary forces that could lead to global warming. In 1975, Professor Ramanathan demonstrated the “greenhouse power” of other trace gases, specifically chlorofluorocarbons (CFCs). He showed that these ozone-depleting aerosols could aggravate global warming, and he demonstrated that one CFC molecule in the atmosphere has the same greenhouse effect of more than 10,000 molecules of carbon dioxide. This finding was the first to demonstrate the degree to which trace gases could alter global climate, and it’s credited with opening the door to examination of other trace gases for greenhouse potential. In 1980, Professor Ramanathan worked with Roland Madden (now retired from the National Center for Atmospheric Research) to publish an analytical-statistical model study in the journal Science that predicted global warming due to the increase of manmade greenhouse gases would be detected by the year 2000. This was confirmed 20 years later by a report published by the Intergovernmental Panel on Climate Change (IPCC) in 2001. In 1987, Professor Ramanathan chaired an international workshop convened by the World Meteorological Organization to examine the connection between trace gases and global climate change. He delineated the role of non-CO2 greenhouse gases in a paper published in the Science in 1988 titled “The Greenhouse Theory of Climate Change: A Test by an Inadvertent Global Experiment.” He is known for fundamental research on Earth’s radiation budget, especially with regard to the role of clouds, and for exploring the “thermostat effect” of clouds in regulating sea surface temperatures in the tropical Pacific. In the mid- 1990s, he helped design the Indian Ocean Experiment to study the effects of air pollution on sunlight, and the project found a vast haze over much of the Arabian Sea, Bay of Bengal, and Indian subcontinent. This “brown cloud” reduces sunlight by as much as 10 percent, and its discovery led to a research program supported by the United Nations that is examining the impact of this air pollution on weather, agriculture, and public health. Professor Ramanathan helps lead this international research effort today. He recently showed that “brown clouds” caused by the burning of fossil fuels could lower ocean temperatures, slow down monsoon circulation, and reduce seasonal rainfall. In a pioneering study with agricultural economists, he linked the phenomenon to a significant decrease in the Indian rice harvest. Professor Ramanathan also showed that black carbon particles in brown clouds absorb far more solar radiation than previously thought, contributing to the warming of the upper atmosphere. Professor Ramanathan was born on November 24, 1944 in Chennai (formerly known as Madras) in southern India. He obtained his bachelor’s and master’s degrees in engineering from two universities in India: he earned a B.E. in 1965 from Annamalai University in Chidambaram and an M.S. in 1970 at the Indian Institute of Science in Bengaluru (also known as Bangalore). In 1974, he earned his Ph.D. in atmospheric sciences in the United States from the State University of New York at Stony Brook, now known as Stony Brook University. 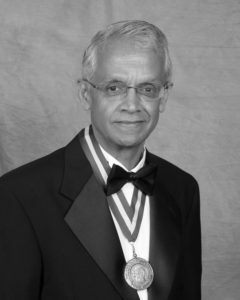 After finishing his doctorate, Ramanathan began working with scientists employed by the U.S. National Aeronautics and Space Administration at the NASA Langley Research Center in Hampton, Virginia. His work with NASA involved the physics of space vehicles reentering Earth’s atmosphere, but the focus of his own research quickly turned to the factors that shape Earth’s climate and to the impact of human activities on the environment, especially with regard to the greenhouse effects of trace gases. In 1975, he published an article in the journal Science titled “Greenhouse Effect Due to Chlorofluorocarbons: Climatic Implications,” and his research and publications during the 1970s are credited with expanding the discussion of greenhouse warming beyond the impacts of carbon dioxide alone. In 1979, he began work with NASA on its Earth Radiation Budget Experiment, and he remains a principal investigator on the project today. In 1982, he began work as a research scientist for the National Center for Atmospheric Research (NCAR) in Boulder, Colorado, and in 1985 he began his academic career as an affiliate professor at Colorado State University in Fort Collins, Colorado. From 1986 to 1990, he was a professor of geophysical sciences at the University of Chicago, and in 1990 he began his long and distinguished career at the University of California in San Diego. He is a Distinguished Professor of Atmospheric and Climate Sciences with the Scripps Institution of Oceanography at UC San Diego, and he is director of two centers at the Scripps Institution — the Center for Clouds, Chemistry and Climate and the Center for Atmospheric Sciences. Professor Ramanathan is a fellow of the American Meteorological Society (1985), the American Association for the Advancement of Science (1989), the American Geophysical Union (1992) and the Indian Meteorological Society (2003). He has been elected to the geophysics section of the U.S. National Academy of Sciences (2002), to the Pontifical Academy of Sciences at the Vatican (2004), to the Third World Academy of Sciences (2006), to the mathematical and physical sciences class of the American Philosophical Society (2006) and to the Royal Swedish Academy of Sciences (2008). Professor Ramanathan’s service on committees and advisory boards, past and present, involves almost 30 organizations. He currently is chair of the Committee on Strategic Advice for the U.S. Climate Change Science Program; a member of the Advisory Board for the World Clean Air Congress, a triennial meeting convened by the International Union of Air Pollution Prevention and Environmental Protection Associations, and a member of the External Advisory Committee for the Earth Observing Laboratory operated by NCAR. Professor Ramanathan also serves as chief scientist for Project Atmospheric Brown Clouds, an international research effort supported by the United Nations Environment Programme and the U.S. National Oceanic and Atmospheric Administration. In addition, he is a member of the science editorial board for the NASA Earth Observatory and a member of the board of directors of the Tata Energy Research Institute in Arlington, Virginia. Professor Ramanathan also has served as a visiting professor at the Université Catholique de Louvain in Belgium (1985-1988), and he was the first K.R. Ramanathan Visiting Professor at the Indian government’s Physical Research Laboratory in Ahmedabad (1998). He is now serving as a distinguished visiting fellow of The Energy Research Institute, New Delhi. He has been a member of many other boards and advisory committees, including panels that served the U.S. National Academy of Sciences (1991-1994), the U.S. National Research Council (1993-1997) and the International Council of Scientific Unions (1994-1999). Professor Ramanathan has received numerous honors and awards in addition to the fellowships listed above. In 1989, he received the NASA Exceptional Scientific Achievement Medal. In 1995, the Royal Netherlands Academy of Sciences awarded him the Buys Ballot Medal, a gold medal given once every ten years to a scientist who has made outstanding contributions to the field of meteorology. In 1997, he was awarded the Volvo Environment Prize from the Volvo Environment Prize Foundation in Sweden for pioneering work on predicting the nature of future changes in the world climate. In 2002, the American Meteorological Society gave him the society’s highest honor, the Carl-Gustaf Rossby Research Medal, for “fundamental insights into the radiative roles of clouds, aerosols, and key gases in the earth’s climate system.” In 2009, he was chosen to be the first Gordon Good Memorial lecturer of the Royal Swedish Academy of Sciences. Professor Ramanathan has contributed to 15 books as an author and editor, and he has published more than 140 papers in peer-reviewed journals. According to the ISI Web of Knowledge, he is listed as an author on 38 articles in the Journal of Geophysical Research- Atmospheres and 14 papers in Geophysical Research Letters, both published by the American Geophysical Union; 17 articles in the Journal of the Atmospheric Sciences and 15 articles in the Journal of Climate, both published by the American Meteorological Society; 11 articles published in Science and six articles published in Nature. He is rated as a “highly cited” researcher by the ISI Web of Science. Professor Ramanathan’s nomination for the Tyler Prize was supported by three scientists who have received Nobel Prizes. One of them is Susan Solomon, a member of the Intergovernmental Panel on Climate Change that shared the 2007 Nobel Peace Prize with former U.S. Vice President Al Gore. The other two are Tyler Laureates — Mario Molina (1983) and Paul Crutzen (1989) — who received the Nobel Prize in Chemistry in 1995. “I consider currently Dr. Ramanathan to be one of the greatest, if not the greatest, climate researcher,” Crutzen said in his letter of support for Ramanathan’s nomination for the Tyler Prize. Copyright © 2019 Tyler Prize for Environmental Achievement. All rights reserved.